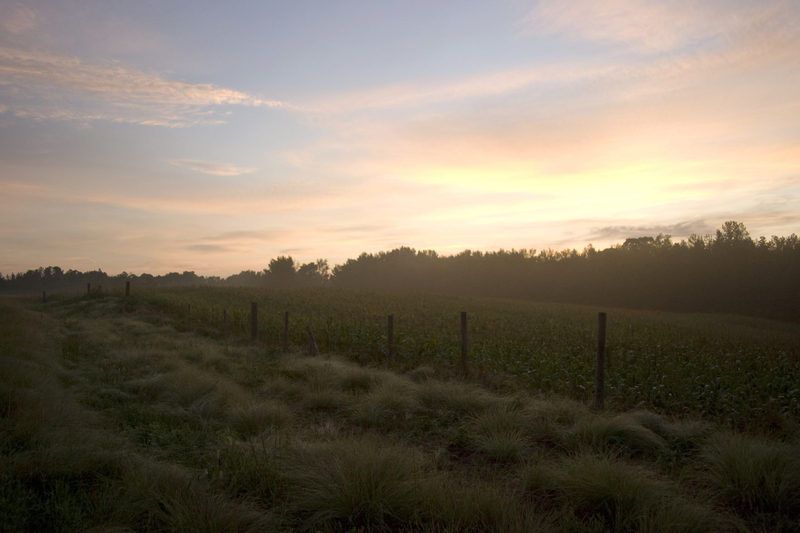 The sun begins to rise over a corn field in Buford, Georgia. July, 2009. Tonight, I have been looking through my archives. I was searching for some images of a friend from about 6 years ago, tabbing through camera raw files in a folder of non-selects, when this image popped up. The image was a snapshot. I didn’t take any other images like it. Just a single frame, snapped on the side of the road while heading home one morning. Snapshots are pure magic; they come together on their own. You don’t work a scene to get one, you are just lucky enough to be in the right place at the right time, pointing your camera at the beauty laid out before you. I like the way my eye runs in the grass down the length of the fence. I love the warm sunrise light washing over a hemisphere of green. I like the slight haze and the fog burning in the background. This image really puts you in the place. This image represents memories of southern summers at home spent irresponsibly and nights with friends that play on a loop in these digital universes. The image is quiet and serene, but full of anticipation as to what the new day will bring. Tell me what you think! Do you love it or think it’s just okay? What does this image portray to you?